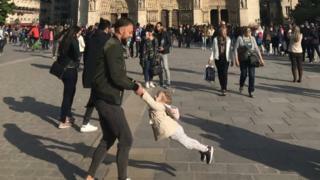 A plea to find two people pictured outside Notre-Dame cathedral minutes before the devastating fire erupted has gone viral on social media. A heart-warming photo shows what appears to be a father and daughter playing happily outside the historic landmark in Paris. Tourist Brooke Windsor, 23, says she took the picture about an hour before the blaze ripped through the building. As it stands, the tweet has been shared 66,000 times by people across the world determined to help Ms Windsor track down the pair. Ms Windsor, from Michigan, US, told the BBC she had yet to identify the man and girl in the photo but was hopeful of doing so. "If it were me, I'd want the memory. Hoping he feels the same way," Ms Windsor, who is visiting the French capital with a friend, said. Ms Windsor said she stood among thousands of people in streets around the cathedral solemnly watching the fire in horror. "We watched in shock and heartbreak with the rest of Paris," she told the BBC.